Blog | June 2018 | Sneak Peek of the brand new Dovecraft and Helz Cuppleditch collections! Sneak Peek of the brand new Dovecraft and Helz Cuppleditch collections! Capture the excitement of a summer’s day at the seaside in your crafts with the Beach Life papercraft collection. Within the paper pack, find adorable illustrations which capture everything we love most about a day at the beach – from beach huts and deck chairs, to sandcastles and ice creams - along with a selection of cheerful patterns in an array of vibrant colours. The paper pack comes in three sizes, 12" x 12", 8" x 8", 6" x 6", perfect for a whole range of uses! For those of you familiar with the previous Helz Cuppleditch collections, you’ll be familiar with these adorable illustrations and the wonderful, nostalgic style! This charming collection also features a glittered decoupage pad, steel cutting dies, washi tapes, and much more for you to create lots of wonderful handcrafted projects. How cute are these little wooden ice cream toppers?! Your crafts are sure to radiate with warmth and nostalgia with this collection. The little characters are too cute! We’re already thinking of what we could use these washi tapes for (we’re loving the deckchair-inspired stripe) – they’re perfect for scrapbooking your summer memories or for adding to cards and envelopes! Everybody needs stickers in their craft stash! As well as complementing this collection perfectly, these stickers are just what you need for adding a finishing touch to your papercrafts. These are also made with a touch of glitter to make them extra special! What do you think to the Beach Life collection? Step into a world of chic bohemian prints with the enchanting Dovecraft Premium Folkland collection. Within the paper pack, explore pages adorned with floral illustrations, alongside butterflies and majestic stags, evoking a sense of fantasy and contemporary fairy tale magic. Find stunning gold foil and glitter detail amongst intricate patterns and a dreamy colour palette, adding extra charm to these designs. The paper pack comes in three sizes too, 12" x 12", 8" x 8", 6" x 6" for a range of uses! To make each craft extra special, this captivating collection also includes lots of coordinating embellishments, including a stamp and die set, sentiment toppers, washi tapes, delicate gold stag charms, and much more to help you create the handcrafted project of your dreams! Just look at these beautiful butterfly toppers – think of how many handcrafted cards you can adorn with these pretties! We love stamps, and we love cutting dies – so what’s better than a coordinating stamp and die set?! These designs work together for you to mix and match in your crafts to create some really unique designs. We’re absolutely loving the tag die with the mini ‘To’ and ‘From’ stamps – sooo useful! Add a touch of glitz to your makes as well as dimension with these cute mini pegs! These felt stag toppers are just too cute! These would be ideal for kids and adults’ alike. What are your thoughts about this new Dovecraft Premium collection? Keep your eyes peeled in stores over the next few weeks to pick up your own and don’t forget to let us know what you think below, we love to hear your feedback! Which is your favourite of these two new collections? Do you have a favourite embellishment? Two gorgeous collections! 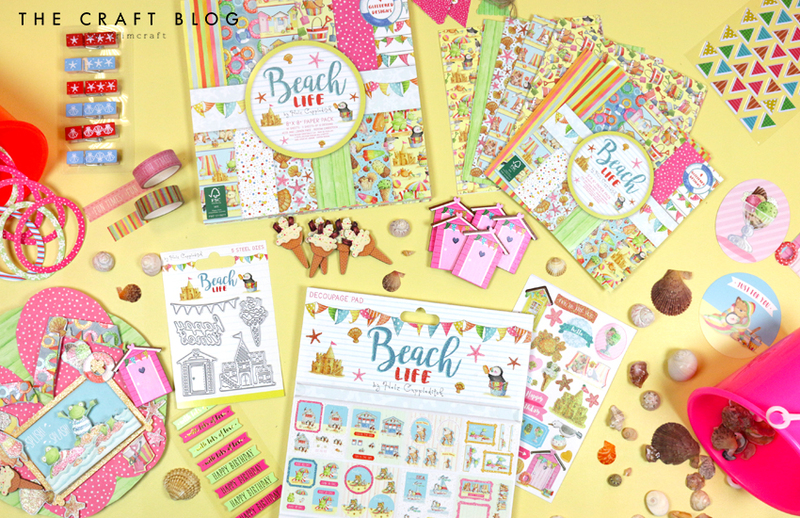 Really love the Beach Life papers and decoupage! And those wooden ice cream toppers and beach huts are sooooooo cute!!! Love the Dovecraft Stamp and dies. Fabulous!!!! If only I had them to demo with!!!!! Such gorgeous collections, I actually said aww out loud when I saw the ice cream cone. Before I even read your post, I had exactly the same reaction when I saw the ice cream cone as well! They are both fabulous, but the beach/ice-cream theme is my must have. Can't wait to buy these - what's better than ice-cream in summer?!? Wow,love the new papers especially the beach theme ones,they are just gorgeous & would make fabulous cards.The little ice cream cones are just adorable.